American Made Eagle Flight Mid Size 36" .40 Cal. Blowgun Black w/ 12 Darts Propel darts like an Amazon warrior with this American made 36" Eagle Flight .40 cal. blowgun. This midsize blowgun features a lightweight barrel complete with a grip, mouthpiece and quivers. The best part is, each one of these Eagle Flight blowguns is made in the U.S.A. Included with the blowgun is a set of 12 darts. I have discovered that a head of a gummie bear will double as Ammo no dart needed . This allows you to practice your aim without the damage to your furniture,walls..(You can't beat the price ). This blowdart gun excels all expectations. This thing is accurate and powerful. light weight perfect size for transport. I've shot birds and frogs, it was very effective! I'm new to blowguns just got this and already I'm enjoying it the ability to shoot it inside and outside safely is pretty cool received it with like a burnt spot on the soft handle but that's worth it ?? I got this for something cool to shoot in my room. It's fully functional and I have no complaints. Upon receiving this product, I notice the barrel was slightly bent. But no worries that was a quick fix. But other then that I can dig this all day long. How's your distance? lol sounds like you're close. A very fine device. The better your diaphragm the better the darts fly (since I've played baritone in bands I am literally lethal with this thing...if I deeply inhale with a VERY sudden & full exhale, the dart buries itslef inside & the fletch comes off XD). This 36" 40 caliber model comes with 12 darts with white fletches (must attach yourself), a quiver consisting of 2 parts (a ring with 16 holes for darts & a guard to prevent pricking yourself, a mouthpiece (very its wider to obviously catch more air), a muzzle piece, and a soft foam grip. The barrel is very straight, and for those like me who can blow hard will find their shots very accurate and fairly consistent. To fire, drop the dart into the mouthpiece & push with a finger until it is fully inside the barrel (tilt up as well,the dart might fall out if you tilt it downwards & its not secure). Then aim by lookig at the target (you will see double-vision of the muzzle, have the target be between yet above the "two" muzzles to be accurate, changing height to compensate for distance & gravity), then blow into the barrel. If you wonder which is best for you, I recommend these as followed... 12" for self-defense, dart-board shooting, and for ninja/assassin lovers. 36" for target, petit-game(like frogs & mice), and standard dense-combat (dense being a large yet thick region making movement difficult, like the jungle/forest or a post-apocalypse urban setting. 48" for advanced target shooting, petit/small game (as in from frogs & mice to squirrels/chipmunks, rats, & small birds) hunting, or long-range dense combat. Either way, I am satisfied with this & will buy both the 12" one & a dart board for my room. REMEMBER: This product is not a toy. In the hands of anyone with a good strong breath this is as lethal as a blade or gun is. Do not give to children unless they are well-trained, can be trusted, and have ADULT supervision. If you are an adult, yes you can leave it somewhere for display but leave few or no darts for kids to get, they can hurt eachother even without the gun if they have the dart. the first thing this is NOT a fake review(I was worried some of them might be). 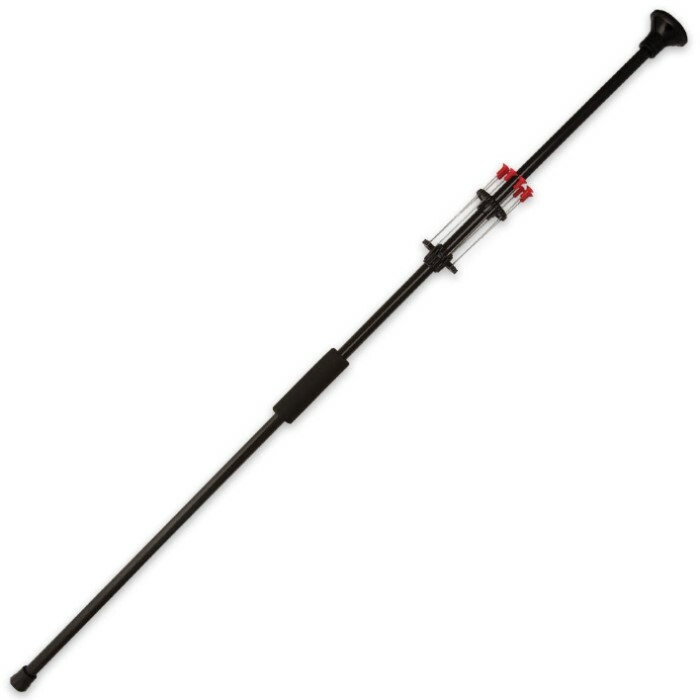 I was kinda scared to buy this product because I've never had a blow gun before but this is worth way more than 11 dollars!!! it is accurate (not pen-point but very good) I hit the target the first time I shot it. I can hit cardboard boxes from 25-30 feet away. This is not at all hard to shoot and the mouth piece is made to prevent inhaling the darts to make it saver for the user. Great product not the slightest bit of buyers remorse. I have never used a blow gun before but when I purchase the 36 Inch Eagle Flight .40 Cal. Blowgun. It took me but 5 minutes to start hitting my target with it. I STRONGLY RECOMMEND YOU PURCHASE THIS BLOW GUN. I know you will have a lot of fun and remember SAFETY FIRST.